More Photos from the Front at Tailhook 2014—Sponsors and Vendors! A symposium would really be nothing more than a bunch of folks gathering at a church picnic with grandma’s Iced Tea and fly challenged potato salad on display… without the Sponsor and the Vendors to capture your attention. The vendors are here for a couple of reasons, oh sure this is a target rich environment for their wares (post hangover meds would be a strong contender for prime vendor…) but this also provides established vendors an opportunity to identify the upcoming needs of the navy, and adjust their offerings accordingly. Our Kathy Schmoldt has been at it again, firing photos of all the sights (and yes even some of the sounds) of Tailhook. Below is her collection this year’s Vendors and Sponsors. Tailhook 2014 is underway in Reno! Fortunately we have a correspondent on the ground and snapping photos like mad! Keep an weather eye out for Kathy Schmoldt, she’ll make you famous! Candids from this year’s event will be posted here to the best of my ability. It is with heavy heart we Tailhookers bid farewell to the sole remaining Original Blue Angel, Cdr. Al Taddeo. Al passed away this weekend after 94 years. This past September, Colorado Mile High Tailhookers were afforded the opportunity to celebrate life with Al in person. He had been invited to join us as our special guest of honor at our Semi-almost-annual Cattle Barron’s BBQ and Tailhook Gathering. A wonderful Soirée put on by Honorary Tailhookers of the Year, 2011 Hans and Kathy Schmoldt. He graciously accepted the invitation. Al was thrilled to be there, not only was he surrounded by like souls, but also by the then current team, and team selects of the 2012 Blue Angels. Stories of daring do soon followed, with hand flying accents littering the low flying airspace. 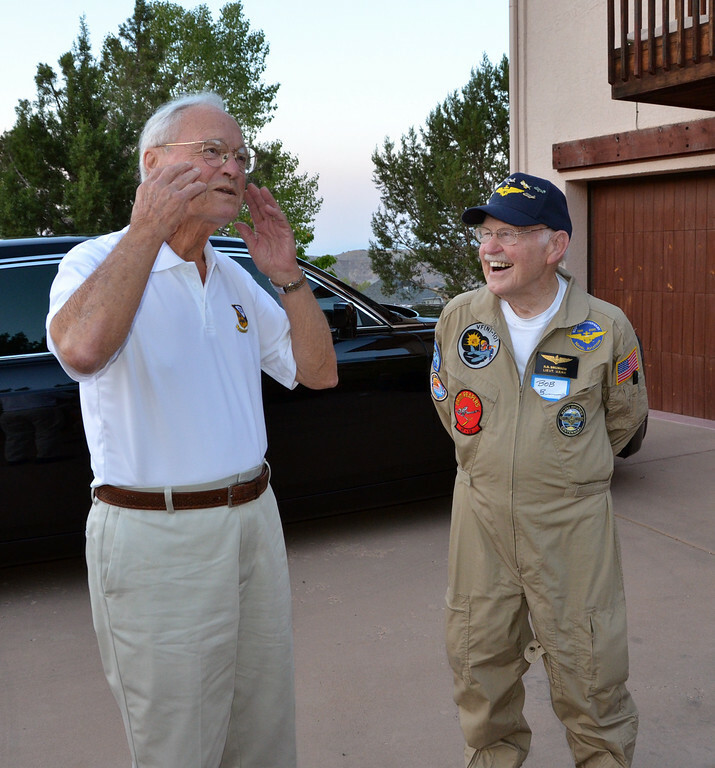 In addition to his family of Blue Angels, Al was especially thrilled to learn that one of his fellow shipmates from his time onboard USS Enterprise CV-6 was in attendance as well, VF(N)- 101 Lt. Bob Brunson. Al and Bob swapped stories and tales from WWII that held our attention well into the evening. Al was a gentleman that night, as he has been all his life. We are proud to have him associated with Naval Aviation, The Blue Angels, and the Tailhook Association. Al, Updated winds are calm, ceiling and visibility unlimited, you own the airfield and the airspace. Cdr. Al Taddeo, departing! He is in the process of chopping an article to appear in “Hook” and for the Naval Aviation Museum in P’cola on the history of JOPA-Mobiles, y’know, the squadron get around cars. And he asked me to ask y’all for some assistance. Happy to oblige. Here is a picture of the VAQ-134 JOPAmobile, now on permanent display in the museum in Pensacola. I am working on a JOPAmobile story for Hook and owe the museum a background on squadron cars throughout Naval Aviation so they can develop story boards for the display. I was hoping you could post the photo and ask folks to send any squadron car photos/stories to my Tailhook email account: tmurph@tailhook.net. Please partake… this is a great part of Naval Aviation history and is a wonderful catalyst for more “There we were…” stories. Not all great aviation tales have to be set in the cockpit. 1. The Nugget is essentially sold out. There are a few rooms left in the Courtyard and the occasional room becomes available when folks are adjusting travel schedules, so it is always worthwhile to call the Nugget and check for yourself. The primary back-up hotel is the Grand Sierra Resort (GSR). The GSR has a Tailhook rate and is really starting to fill up. I checked today and there are still plenty of rooms available. There is a shuttle between the GSR and the Nugget but, if forced into a cab, the fare isn't that bad (I am speaking from personal experience over the last few years). The GSR has recently completed a massive renovation and is a great hotel. 2. I have received several questions from folks regarding airlifts, particularly during the Tailhook Mentorship Day in Pensacola. Airlifts have not been officially ruled out, but I feel it would be prudent in these challenging financial times to make you travel reservations today on your own. I recommend selecting the option to cancel your reservations if an airlift becomes available, but I believe delaying purchasing an airline ticket any more doesn't make any financial sense. Naval Aviation Leadership is aware of what has been done in the past and are looking at all of the options/possibilities, but I believe everyone's expectations need to be realistic. 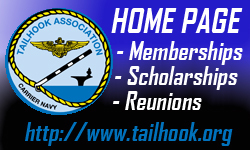 This is going to be a tremendous Tailhook this year and you don't want to miss it. 3. Please take the time to take the THA survey. Here’s the LINK. I know JR sent out the link to every member, but I would like to drumbeat his efforts here and ask you pass this along to your local members. We can't fix it or improve it if we don't know about it. This is your association, so please take the few minutes to take the survey. We have all been receiving feedback since FAM-1, so constructive and brutally honest feedback is expected. 4. Please update your contact info. I receive several kicked back emails every month due to having out of date email addresses with contact information. If you have a new ISP, moved recently, or changed employers, you might fall into this category. Just like when you checked into a new command, please take the few minutes to update your recall. If in doubt, we will also provide the opportunity to update your info at the Membership Booth at Hook this year. We can even remind you when your membership expiration is. If in doubt, check with the SDO at the Membership Booth! 5. The 5-Year membership price has been reduced and we expect to have a Sequestration Impact Lifetime Membership price for those in attendance at Hook this year. Please come on by the Membership Booth. 6. We are planning on accepting questions for Saturday's Flag Panel from Thursday afternoon until 1200 Saturday. We do not want to take away from the live Q&A Saturday, but we understand some folks cannot be there Saturday and have a question to ask as well as provide another avenue to present a question to the Flag Panel. There will be a collection box at the membership Booth, as well as question forms. We will accept already prepared questions as well. 7. Please pass along any thoughts/ideas for the Tailhook Strike Force. LCDR Mike "Jockey" Lisa has volunteered to take on the task of revamping the TSF and we look forward to any inputs or volunteers. 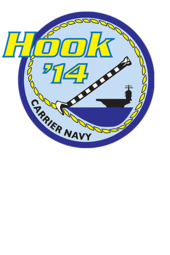 Again, this is going to be a great Tailhook this year. From the Bug Roach Mixer being extended through 2400 Friday night to RADM "Bad Fred" Lewis moderating a Vietnam-era Fighter/Attack panel and Alvin Townley moderating "Hanoi Hilton" panel. I am standing by for any questions/comments you have. Once again postings on these here parts have been rather anemic… I’d like to blame the sequester, but hell, who am I kidding? I’m a Life Member Tailhooker, civilian, working for a successful private company! The gummint takes away funds for sure from my operating budget but usually in the form of 1040 filings. Step one has already been completed, like a property owner walking up to a barn on his long forgotten spread, there was some weed killing to be completed. Not visible to you, the four remaining readers of this blog, behind the scenes the Daily Briefing had been carpet bombed by comment spammers! I have subsequently deleted and banned the offending culprits. I cannot, for the life of me figure out why a spammer would even begin to think any Tailhooker needed a lifetime prescription to Viagra! Really? Know your audience! Step three will be updating the banner at the top of this page, to reflect the current year. I say step three, because step two will be publishing a post by TMurf about the upcoming Reunion in Reno! That’s next! So, we’ll see if we can keep a good head of steam this time and keep her into the wind. I’ll launch articles as best as I can, but I could always use your thoughts and writings as well, don’t be shy! Capt. Sara Joyner takes Command of Airwing 3. The first woman to hold the honor! Captain Sara “Clutch” Joyner, a native of Maryland, received her commission in 1989 graduating with merit from the United States Naval Academy with a Bachelor of Science degree in Oceanography. After graduation, she attended flight school and earned her Naval Aviator wings in July 1991 from VT-24 in Beeville, Texas. After completing flight training, Captain Joyner reported to VC-5, the “Checkertails,” in Cubi Point, Philippines to fly the A-4E Skyhawk. In May of 1992, due to the imminent closure of Cubi Point, she was assigned to VC-8, the “Redtails,” in Roosevelt Roads, Puerto Rico. Captain Joyner reported to COMSTRKFIGHTWINGPAC in Lemoore, California in November of 1994 as Assistant Operations Officer. She subsequently received a transition to the F/A-18 Hornet and reported to VFA-125, the “Rough Raiders,” for training in October of 1996. Upon completion of her training as a Hornet Pilot, she reported to VFA-147, the “Argonauts,” in May of 1997. Remaining with VFA-147 for both her Junior Officer and Department Head tours, she completed two Western Pacific Cruises to the Arabian Gulf aboard USS NIMITZ (CVN 68) in September of 1997 and USS JOHN C. STENNIS (CVN 74) in September of 1999 in support of Operation SOUTHERN WATCH. In November of 2001, she again deployed with VFA-147 aboard USS JOHN C. STENNIS in support of Operation ENDURING FREEDOM. During her tour at VFA-147, she served in many capacities, including the Department Head in Maintenance, Operations, and Safety. In January 2002, she reported to United States Joint Forces Command, Norfolk, Virginia where she served in the Current Operations Branch as Force Deployment Officer for the NORTHCOM, EUCOM, and CENTCOM Areas of Responsibility in support of Operations ENDURING FREEDOM and IRAQI FREEDOM. She reported to VFA-105 in November of 2006 as Executive Officer. In March 2007, Captain Joyner assumed command of VFA-105. On 2 November 2007, she led the Gunslingers on their combat cruise to the Persian Gulf in support of Operation Iraqi Freedom. Under her leadership the squadron performed nearly 2,000 combat missions totaling over 4,900 flight hours and delivering 35,000 pounds of ordnance in support of coalition ground forces in Iraq. Captain Joyner recently completed her tour at OPNAV N88 as the Joint Strike Fighter Requirements officer responsible for bringing the next generation of carrier strike aircraft to the fleet.